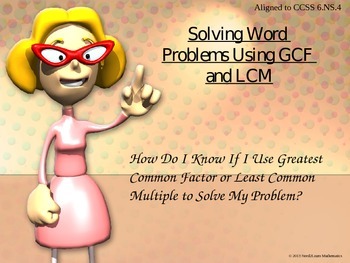 How can you tell if a word problem requires you to find the GCF or LCM? In this lesson, students are given the opportunity to read, analyze, and interpret the "hidden" clues within these types of word problems. By using specific strategies and word phrases, students develop a better understanding of what is being asked of them. This is a perfect activity to use as whole group or within a technology based (eMINTS) classroom. This activity promotes group and classroom discussions while fostering higher level thinking skills. This activity is aligned to the 6th Grade Common Core Standard 6.NS.4.